It's been a few months since we last got together to talk about the world of technology recruiting. Since then a lot has happened. An entire industry exploded as the Internet Boom became the Internet Bust. Oddly enough, pressure to find and hire top talent in the IT sector continued unabated, proving the old adage that there's plenty of mediocrity out there, but finding quality still takes time, effort, and intelligence. Thanks for visiting; Don't forget to check back here for Issue #3 in June! Today we're talking about essential skills to win the talent war. Recruiters have to focus on two main items to assure the survival of their companies, and by extension, themselves. Item One is the development of unique, or at least imaginative methods of sourcing talented staff. By looking in less traveled spaces, your chances of finding passive candidates who haven't been picked over by every recruiter in the Western Hemisphere increases. Item Two is the development of your own value proposition. We all work in an environment where production is king. How will you add value to your customers this year? We spend most of our time studying companies who ask for help in developing their recruiting programs. Some are on the ropes and need a lot of help, fast. Others are start-ups trying to develop world-class practices from scratch. And some are already more effective than they realize and just need some tweaking to add capacity, create new sourcing opportunities, or develop an effective marketing strategy to draw candidates. As a result of our performance benchmarking and industry research, we've discovered some strong differentiators in high-performance recruiting organizations. Many center on a critical shift in the assumptions and models that world-class recruiting practices use. The chart below shows the main differences we've observed between traditional and "quality-based" recruiting practices. The drivers behind these changes are pretty straightforward. Operating Model: In successful organizations the operating model for recruiting has shifted focus to the value generated per hire because opportunity costs are high and product and opportunity life cycles are shorter than ever. More than 50% of businesses in a recent InfoWorld survey say that hiring shortfalls materially affect their ability to develop and launch products. Delays in bringing key people aboard can take an opportunity off the table forever. To quote Warren Beatty in "Heaven Can Wait," "We don't care how much it costs, we just care how much it makes." Aggressive companies pursue this strategy even in downmarket conditions. And they tend to hold market share and are poised for recovery. Organizational Alignment: The idea of serving corporate customers (hiring managers) is critical to successful organizations. Time and time again we've talked with managers who chose to cut recruiters out of the selection and hiring process because they don't see the value of including them. Either the recruiters don't demonstrate understanding of what the manager wants in a new hire, or they don't generate leads as useful as those provided by third party agencies. These aren't the right conditions for centralized recruiting and hiring. Recruiters risk being trivialized if they're not dedicated to a business unit, and in the field learning everything about the business they're supporting. Recruiting Activity: Many organizations conduct "binge" recruiting, mobilizing only to fill open headcount. Bad idea on several levels. First of all, if you're hiring as part of a larger economic expansion, you're engaging at the same time all of your competitors are, making your job and your probability of success lower. Second, recruiting is all about human beings, who become discontented, look for new opportunities, and decide to change their lives according to internal concerns that often have nothing to do with the economy. If you're not looking when they surface, somebody else gets them. The third problem with episodic recruiting is related to the second. If you aren't on a constant hunt for talent, you limit yourself and your organization to whatever sampling of candidates is available or amenable at the time. It's like trying to time the stock market. Smart organizations are on a constant search for talent. If there's an open slot, fine. But that doesn't drive the search. They are always prepared to hire a star with or without a job requisition, and network with promising candidates as they find them. Recruiting Profile: A prominent software company in the mainframe applications days had a rule about building their sales force. Nobody started there. Entry level prospects began as recruiters. What worked 15 years ago still works today. Recruiting is all about marketing and selling now. The scarcity of real talent means that recruiters have to become both strong qualifiers and persuasive sellers. Recruiter Alignment: Again, to be viewed as an asset by management, it helps to be viewed. Dedicating recruiters to business units helps them and helps the business unit. Recruiter Role: Success comes from focus. Rather than requiring recruiters to engage on many unrelated positions, smart organizations give them a chance to excel by focusing their activities on candidates and skill sets germane to their business unit or division. Technical recruiters focus on tech hires, sales on sales, and so on. Sourcing Guidelines: All things being equal, speed trumps cost in smart organizations. Cisco has ramped up to turn hiring cycles in a week or less. They do it through a variety of tools, like an applicant-friendly web site, early involvement of line staff to evaluate candidates, and a recruiter-centric infrastructure. Recently, Mirage Resorts, parent company of Las Vegas' new Bellagio Hotel, spent a million bucks and used a 14-month infrastructure development cycle to recruit and hire 9,600 people in less than six months. And representatives from Cisco flew down to benchmark their system. Recruiter Metrics: All things being equal, speed and quality trump cost in recruiter evaluation, to. Consider this example: You're looking for implementation consultants for a technically complex software product. No matter how good the candidate, you anticipate a learning curve of one month before they're ready to meet and work with clients as part of your implementation team. However, once up to speed you can bill them out at $140/hr., or $24,360/mo. Recruiter A employs traditional and Internet advertising and posting methods to look for prospects. He takes eight weeks from receipt of a job req. to find, evaluate and close one candidate. Assume a cost-per-hire of $5,000. Recruiter B employs Internet data mining to track all web pages that link to a competitor's web site. In two days, she identifies four potential passive candidates and closes one within four weeks. Assume a cost-per-hire of $1,700. Recruiter C picks up the phone and calls a third-party agency. She has three leads in one week and closes on one candidate in two weeks. The base salary for the position is $90,000 and the agencies' cut is 25%, or $22,500. In smart organizations, time has value, and CPH is just part of the equation. Take a look at the diagram below. Here we estimated that our new consultant would generate about $13,000 for our company every month, after their 30-day training period and after her salary and benefits are deducted from her monthly billings. 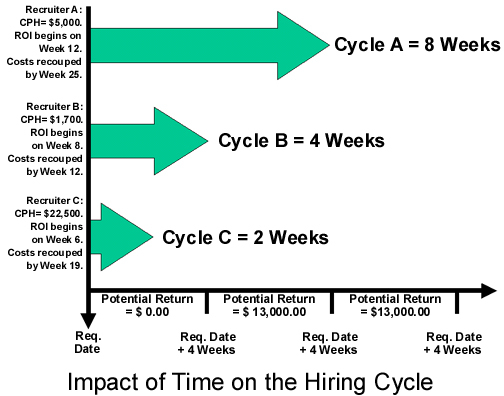 To get the full impact of hiring cycle times, we are including the lost earnings opportunity caused by hiring cycle length. So, Recruiter A's hire starts their non-productive period on week eight and goes through week eleven on our chart. On week twelve, they begin to work against an investment that includes the $5,000 CPH, their salary for the first month on the job (about $11,500 including benefits), and an opportunity cost to the company of $26,000. This employee will become profitable in their 25th week of employment. Taking this view brings some surprising aspects of hiring into focus. When cycle time and opportunity costs are taken into account, the third-party agency hire (Recruiter C) beats the traditionally sourced hire to profitability by six weeks. The most creatively sourced candidate (Recruiter B) also recoups costs very quickly because the initial costs are low. This is a fairly simple example that takes just a few major cost factors into account. But it does illustrate the value of time as a component of the recruiting process, and the underlying reasons that speed and quality are more important to smart organizations than simple cost containment. Candidate Profile Focus: Experience is a useful tool for first-pass culling of applicants. After all, trying to turn a food-and-beverage salesman into a quota busting Account Executive for your e-CRM application is a flyer most managers won't want to take. But smart organizations actively search for and evaluate essential competencies that create a strong likelihood of success in a candidate. Variables like those we're discussing today - discernment, proactivity, competitiveness, persuasion - are the building blocks of success. Given a choice between hiring someone with few demonstrated competencies and tons of job-related experience, and a candidate with less experience but a well-stocked toolkit of competencies, smart organizations often go with the less experienced candidate. This covers the major drivers behind the quality-based recruiting model. Now that we've covered these at the macro level, it's time for a little checklist we've developed for you. It shouldn't surprise you that the quality-based recruiting model tends to favor some skills over others. Based on our observations, we've come up with a profile of highly successful recruiters in the information technology industry. We hope it helps you verify and reinforce competencies that you have, and provides useful tips. Comments are included when appropriate. Is both a strategic & a tactical asset. Is a partner, not a conduit. These people don't simply toss resumes over the wall after an experience validation and leave qualification to the hiring manager. They seek to add value to their customers. Sees self as an operational asset. In keeping with the rules for recruiter alignment, they are dedicated to a specific business unit, and are proactive in getting to know their associates and learning the business they're supposed to support. They see the manager as their customer. Primary driver of the recruiting process. They are proactive in the process, functioning as surrogate managers, and provide support throughout the recruiting cycle. Develops & refines essential elements of information. Early in their tenure with an organization, they start and constantly update a list of important information, elements of data and questions. They pay particular attention to the "buying agenda" of their hiring managers, the specific competencies that are considered vital in new hires, the skills and areas of expertise of the members of their business unit, their assessment of the business unit's predominant culture, and the experience profile of successful hires. Anticipates their hiring manager's needs. Largely a function of good data management and observation. Looks for evidence of cyclical hiring behavior, threats to workforce integrity from business or economic factors, numbers of poor performers in the group, and keeps a schedule of probable hiring needs. Is a student of their industry. Takes the time to woodshed on what's gong on in their marketplace, their company & their competition. Understands that they need to be conversant with all three to be an effective pitchman and/or apologist when interviewing and selling candidates. Knows the typical strengths and weaknesses, advantages and disadvantages inherent in candidates from other companies. Spends time in the trenches. Enjoys being a part of their business unit. Develops rapport with managers and teammates. Observes unit dynamics and takes advantage of every learning opportunity. Benchmarks group competencies; refines hiring profiles. Carefully studies success criteria in their business unit. Seeks to recruit "perfect composites." Understands complementary and destructive trait combinations. Brings their own discernment to bear on business unit competencies. Considers the benefits of new behavioral traits to the group. Reviews job descriptions with measurement in mind. Translates descriptions into behavioral categories that can be discovered and measured during interviews. Understands the advantages of constant presence in the talent bazaar. Takes candidates from resume review through buying critera to basic evaluation of competencies. Doesn't require management to qualify. Presents only candidates that conform to manager's selection criteria. Saves their credits with the business unit for the detailed evaluation phase. Good at discovering what's important to prospects. Doesn't jump to conclusions about a candidate's buying agenda. Negotiates for information throughout the sales process. Asks for commitments, clarifications throughout the recruiting cycle ("closes doors"). Knows the strengths and weaknesses of his company/unit, and is a good spin doctor. When appropriate (or necessary), is willing to ask senior managers to contact strong candidates for key positions early in the cycle. Negotiates and closes candidates well. Realistically gauges power (theirs and others). Practices positive control ("Why you should work here."). Practices negative control ("Why you shouldn't work there."). Keeps tabs on new hire performance. Uses job performance to refine hiring model. Consults with management on how to enhance performance based on behavioral evidence discovered during pre-hire evaluation. Knows the keys to employee retention. Knows it's almost always cheaper to keep employees than to replace them. Knows that well-managed staff in companies with low turnover are unlikely to leave unless the competing offer is for 20-30% more than their current salary. Knows that well-managed staff in companies with low turnover are likely to stay for a counteroffer that is 10-15% more than their current salary. Knows that poorly-managed staff in companies with high turnover are likely to leave for an offer that is 10-15% more than their current salary. Knows that poorly-managed staff in companies with high turnover are unlikely to stay, even when offered retention bonuses or reassignment. Knows the quality and challenge of the work experience can be more valuable than money; counsels management on specific opportunities for valued employees (e.g., education, reassignment, input to policy, etc.). Understands real cost-per-hire, value-per-hire and opportunity cost issues. Knows that opportunity can be fleeting, and that speed & quality are priorities. Effective influencers & change managers. Orchestrates the recruiting cycle. Works to make management time commitments to hiring predictable and efficient. Evolves over time into a prescient judge of management priorities and selection criteria. Acceptance of recommended candidates becomes a "rubber stamp" process. Understands and exploits the power of information & research. Primary business model & direction (industry-wide). Client company business models & direction. Candidate evaluation metrics, screening tools & evaluation paradigms. Uses performance reviews to refine hiring models. Looks for cyclical hiring patterns/trends. Looks for self-imposed performance detractors. Recommends changes that add value. Studies industry research, market influencers. Monitors competition's investor calls (www.bestcalls.com). Assesses current staff for candidate "touchpoints." Preferred publications & sources of information. Incorporates counter-intelligence measures into recruiting plans. Non-Disclosure Agreements during candidate evaluations. Job postings, responses used to gather information about competitors. Leverages all candidate sourcing channels. Uses conventional channels, but knows that real leverage exists in imaginative solutions. Unobtrusive observation (N.B. This covers a variety of tactics. One of our favorites is a recruiter who begged a few bucks and placed brandy snifters in restaurants near their biggest competitors. You guessed it; a business card in the snifter got you a chance at a free lunch. For the price of a weekly plate of Kung Pao Chicken, all the cards were sent to the recruiter after each drawing. A cute idea, and it's easy to trace your hottest opportunities; just discontinue the program in bistros that don't draw your prospects.). Maintains contact with candidates regardless of hiring decision. Maintains contact with company alumni, extends offers as appropriate. Assesses, networks with & recruits employee references. Asks new hires for referrals on day one. Builds foolproof incentives for internal hiring & referral programs. Mostly, this requires a keen nose for unintended consequences. Here's just one real world example of a bad set-up. A company we've worked with set a headcount target for its' sales group and tied it to a cash bonus for the manager. The manager rushed several poor hires through the system to hit his goal, got the check and fired the poor hires shortly after. Bad manager? Hard to argue against it. But a poor incentive, too. There was no tie to productivity or turnover. People will behave in accordance with their metrics. Think carefully about what you want to reward. Tracks industry layoffs & outplacements (www.airsdirectory.com). There are numerous web sites that track this kind of information. Some of the best have URLs that are not fit to print. Uses the Internet, but doesn't depend on it. Will post to relevant job boards, but doesn't spend a lot of time searching there. Uses Internet data mining to locate and contact passive candidates. Plays the percentages (web pages linked to competitor's web sites, selected academic/alumni sites, professional associations). Adept at advanced searches using Internet search engines. Keeps up with advantages & disadvantages of common search, metasearch engines. Knows the trait profile for dedicated Internet sourcers. Knows the rules for building an effective online careers web site. Links careers page to homepage. Doesn't regurgitate job descriptions; packages attractive opportunities. Benefits & culture data on careers page. Accepts wide variety of data formats. "Mail to:" option for postings (i.e., "E-Mail a friend"). Using employees for candidate orientation, evaluation. Includes review procedures for dropped agencies. Can sell their opportunities more effectively than any agency. Liaison with product marketing & competitive intelligence organizations. Develops (or appropriates) an applicable hiring model. Knows that experience is a "necessary but not sufficient" factor in the evaluation process. Knows what can be taught after the hire. Knows what behaviors must be present on day one. Knows that past performance in similar environments is the best predictor of future performance. Knows the company's culture & doesn't waste time fighting it. Understands behavioral traits & their interactions. Measures candidates against an objective standard, not one another. Takes company business model and direction into account. Understands hiring metrics, screening tools & evaluation paradigms. Uses team interviews to validate all relevant variables. Does not pull the trigger simply because pressure to hire exists. Advises management on techniques for getting best performance from newhires. Stays engaged after the hire. Uses performance data to refine hiring model. Moving Targets: We're on a constant hunt to learn about innovative approaches to IT recruiting. If you think we've missed something important, or want to ask a question about the information in this handout, you can reach us here (see below) or at 877-389-1250.
fluent in more forms of jargon than just HR. So how ya doin'? Here's an interesting anecdote. A few months ago we were involved in a training gig with a good-sized apps software company. Nothing unusual about that. But during the session we'd focused on the need for recruiters to develop their personal sales skills. At one point, we asked a technical recruiter to craft a sales message to convince a particularly ambivalent software engineer to join up. Things were going fairly well. The recruiter was hitting non-monetary points like technicalchallenge and the company's emphasis on R&D to stay ahead of the pack. Then she says, "And our applications are fully web-enabled, all Java." Pretty cool, except there's no Java in them there apps. The company had created a beautiful suite of business software applications. All XML, no Java. What's the big deal, you ask? Well, put yourself in the Birkenstocks of a twenty eight year-old Cal-Berkeley grad who's earned every penny of his adult life through the Internet. Things are going fine, they're thinking seriously about throwing in with your company, andthis misstatement floats through the room. Now the recruiter's credibility is in question. The engineer wonders what the recruiter's level of commitment to their trade is. After all, he'd read about the company's fully XML product line in Information Week last August, it came up again at Oracle OpenWorld and he's been following a shooting war between some software engineers in competing companies in a newsgroup he monitors. How come the recruiter didn't know? The point of this is that, like any hunter, you've got to spend time in the jungle. In all ofrecruiting, but particularly in IT, superficial familiarity with the skills and tools your best candidates own and use will hurt you as often as it helps. If you're a technical recruiter, get to know the technology your programmers and engineers use. You don't have to become a power user (though it couldn't hurt). Buy a CD-based course on Java, or Active Server Pages, or whatever. Check out online tutorials at Webmonkey.com. Invest in your growth. Are you a sales recruiter? Then like Stanislavsky said, learn the method. Pick up NeilRackham's book, Spin Selling. Or Michael Bosworth's Solution Selling. Spend a couple of rainy nights with Selling to VITO. You have to be able to converse credibly with your candidates. No screening tool, proficiency test or resume can replace the insight you are capable of, when you've armed yourself with the right information set. Like Emil Faber, the founder of Animal House's Faber College said, "Knowledge is Good." That's it for this quarter. Thanks for stopping and we'll see you again in June.Got a question or a comment? Contact the author here. © 2000-2002 Selection Strategies, Inc. All Rights Reserved.